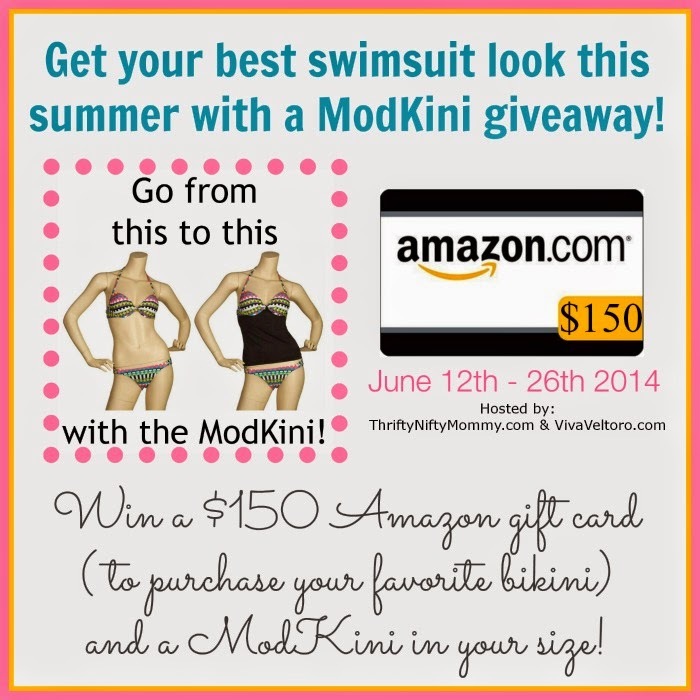 The ABCD Diaries: ModKini + $150 Amazon Gift Card #Giveaway! Welcome to the ModKini & $150 Amazon gift card giveaway, sponsored by ModKini and hosted by Thrifty Nifty Mommy and Viva Veltoro. One piece swimsuits are gravity grabbers. Pulling down "the girls”, losing our waist and womanly shape. Bra style tops now help alleviate that issue, only leaving you to struggle with the length in hopes of avoiding a wedgy or saggy look. Even if you are lucky enough to find (and can afford) a flattering and stylish one piece bathing suit, then there is the issue of taking off a wet one piece bathing suit to go to the bathroom. Tankinis offer more options, yet most women have significant size differences between their breasts and their waist. The challenge with a tankini is you get one size top meant to fit both areas. Many people find a tankini that fits their midsection, only to then discover that the the top is not the right size which results in less support. If you find a tankini where the top fits correctly, then inevitably the midsection would either be too loose and float up in the water or too tight and rise up with any movement, causing you to constantly pull down on the tankini. Whether “the girls” are natural, enhanced (temporarily from pregnancy or breast feeding or surgically), or reduced (surgically or the first thing to go when losing weight) there always remains that struggle to find a tankini that fits correctly and will be flattering in both areas. Bikinis offer the support we all want. They fit better because you can buy the top and bottom separately. They usually cost less and have more options than we want to take the time to count. They do not, however, provide the coverage some of us are looking for, which leads to some women throwing a tank top over their bikini for coverage. We all probably know at least one woman (maybe it's you) who won't get into a swimsuit due to the challenges of finding the best bathing suit for her body. Let’s face it, as women we are all a little harder on ourselves than anyone else. ModKini was invented because we are all uniquely shaped and cannot be generalized! Modkini's goal is to help women feel better in a bathing suit by having the ability to customize the sizing and providing more options. Thrifty Nifty Mommy recently wrote a review of the ModKini. Check it out to hear what she (and her sister) thought of this new swimsuit option! Find out more about ModKini and purchase one today by visiting their website, www.modkini.com. One lucky person is going to win a ModKini in the size of her choice, PLUS a $150 Amazon gift card so you can purchase your favorite bikini to go with it this summer! They have a limited quantity since this is the first run, so if you’d like to purchase one, don’t delay! These are sure to go quick! If you are the winner, ModKini will refund your purchase for you. This giveaway is open to residents of the US only who are 18 years of age or older, unless prohibited by law. The giveaway will end at 11:59pm EDT on June 26th, 2014 and a winner will be drawn randomly from all eligible entries received. Enter using the Giveaway Tools entry form below. Good luck! Cannot wait for the Giveaway to end in two weeks?? Want to use your ModKini now? ModKini plans to reimburse the winner if they have already purchased one! So go ahead and buy your ModKini today and enjoy it before we announce the winner!